This post was written as a reply to a question asked in the Data Mining course. When to use the cosine similarity? Now the data can be plotted to visualize the three different groups. They are subsetted by their label, assigned a different colour and label, and by repeating this they form different layers in the scatter plot. 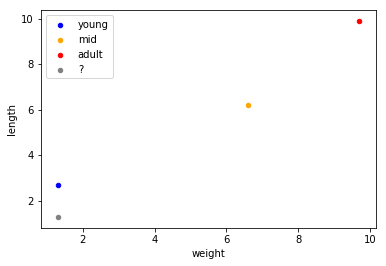 Looking at the plot above, we can see that the three classes are pretty well distinguishable by these two features that we have. Say that we apply $k$-NN to our data that will learn to classify new instances based on their distance to our known instances (and their labels). The algorithm needs a distance metric to determine which of the known instances are closest to the new one. Let’s try to choose between either euclidean or cosine for this example. 0 = young, which is what we would visually also deem the correct label for this instance. Now let’s see what happens when we use Cosine similarity. 2 = adult, which is definitely NOT what we would deem the correct label! This is a visual representation of euclidean distance ($d$) and cosine similarity ($\theta$). While cosine looks at the angle between vectors (thus not taking into regard their weight or magnitude), euclidean distance is similar to using a ruler to actually measure the distance. In our example the angle between x14 and x4 was larger than those of the other vectors, even though they were further away. Cosine similarity is generally used as a metric for measuring distance when the magnitude of the vectors does not matter. This happens for example when working with text data represented by word counts. We could assume that when a word (e.g. science) occurs more frequent in document 1 than it does in document 2, that document 1 is more related to the topic of science. However, it could also be the case that we are working with documents of uneven lengths (Wikipedia articles for example). Then, science probably occurred more in document 1 just because it was way longer than document 2. Cosine similarity corrects for this. Text data is the most typical example for when to use this metric. However, you might also want to apply cosine similarity for other cases where some properties of the instances make so that the weights might be larger without meaning anything different. Sensor values that were captured in various lengths (in time) between instances could be such an example. How do Euclidean Distance and Cosine Similarity Relate? Let’s consider two of our vectors, their euclidean distance, as well as their cosine similarity. print("vectors \t", x0, x1, "\n"
"euclidean \t", euclidean_distance(x0, x1), "\n"
We divide the values of our vector by these norms to get a normalized vector. print("vectors \t", x0_n, x1_n, "\n"
"euclidean \t", euclidean_distance(x0_n, x1_n), "\n"
print("vectors \t", x0, x4, "\n"
"euclidean \t", euclidean_distance(x0, x4), "\n"
print("vectors \t", x0_n, x4_n, "\n"
"euclidean \t", euclidean_distance(x0_n, x4_n), "\n"
print("vectors \t", x0, x00, "\n"
"euclidean \t", euclidean_distance(x0, x00), "\n"
print("vectors \t", x0_n, x00_n, "\n"
"euclidean \t", euclidean_distance(x0_n, x00_n), "\n"
So when is cosine handy? Let’s consider four articles from Wikipedia. We use the Wikipedia API to extract them, after which we can access their text with the .content method. Here we can see pretty clearly that our prior assumptions have been confirmed. ML seems to be closest to soccer, which doesn’t make a lot of sense intuitively. So, what happens if we look at cosine similairty (thus normalising our vectors)? ML is closer to AI! Granted, it still seems pretty close to soccer an tennis judging from these scores, but please note that word frequency is not that great of a representation for texts with such rich content. Hopefully this, by example, proves why for text data normalizing your vectors can make all the difference!